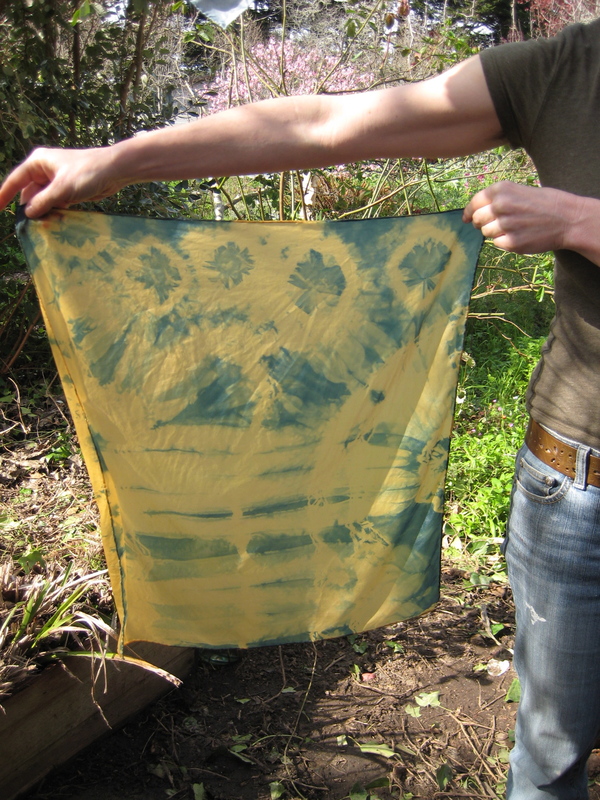 The first annual Permaculture Marin dye workshop was as pleasant a day as could be imagined. The clouds parted, the blossoming fruit trees stood above dense carpets of multiple shades of green, and the people gathered. 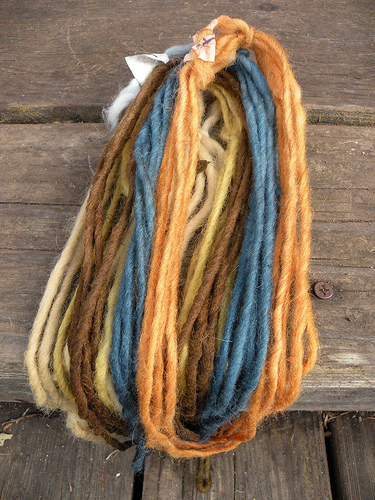 An intersection of passion, prior experience, and curiosity brought together a group of men and women with a broad background of weaving, teaching, gardening, farming, and spinning experience. We created a laboratory of creative color — using toyon, indigo, black walnut, fennel, french broom, coffeeberry, iron, and tannin. 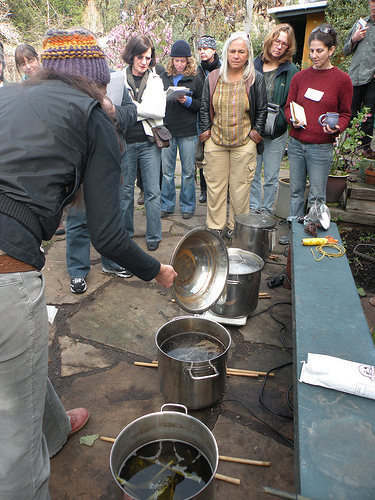 The indigo vat was slow to ferment the day before the workshop–too cold for the yeast. 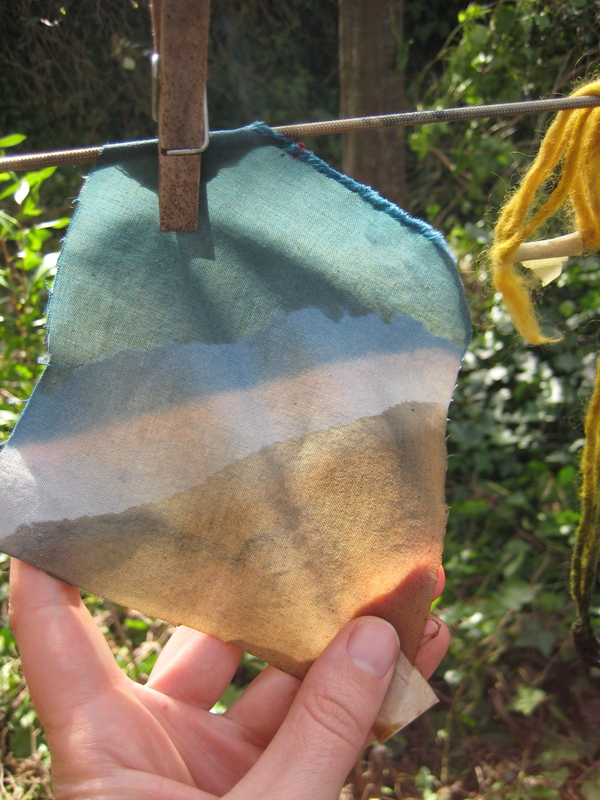 The sun came out for just enough time to coax it into producing some very lovely blues. 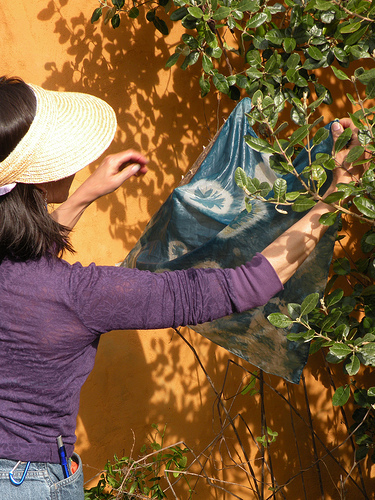 This workshop took place at one of the most beautiful of gardens. 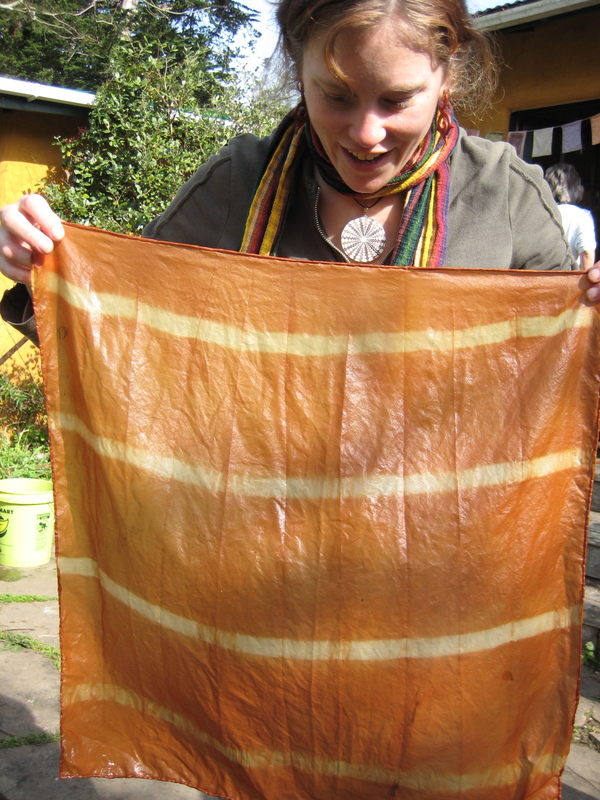 Originally planted, designed and cared for by teacher, farmer, and weaver Penny Livingston of the Regenerative Design Institute in Bolinas. 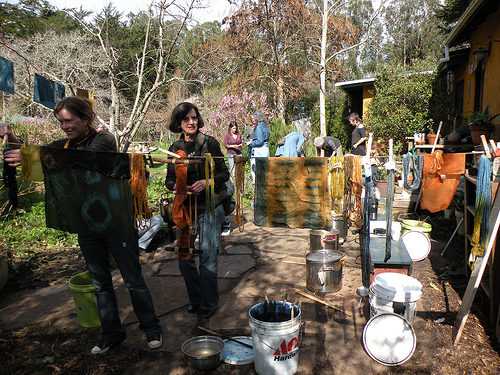 The land is now tended and cared for by Lauren, Dave and Molly– all teachers, and gardeners extraordinaire. 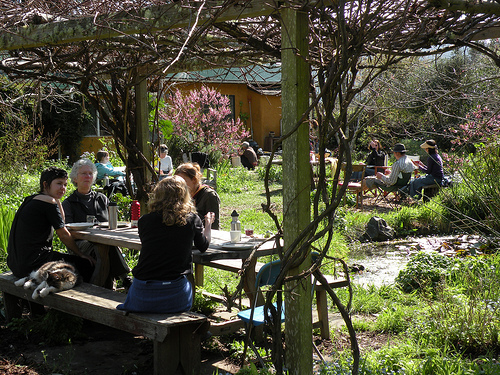 The strawbale structures, the gray water systems, the orchards, and the silver dollar eucalyptus planted for its dye properties are just some of the many elements of this amazing homestead. 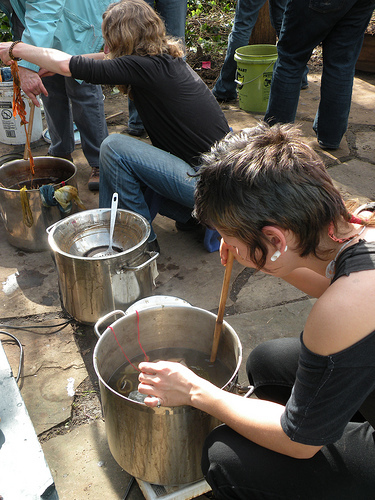 The dye pots getting introduced to the people. 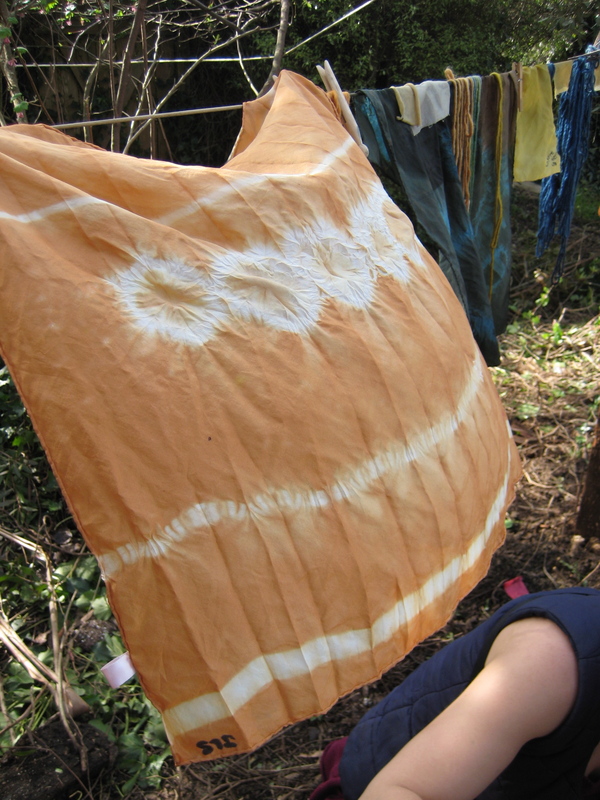 The creations were mesmerizing– the colors soft but striking. 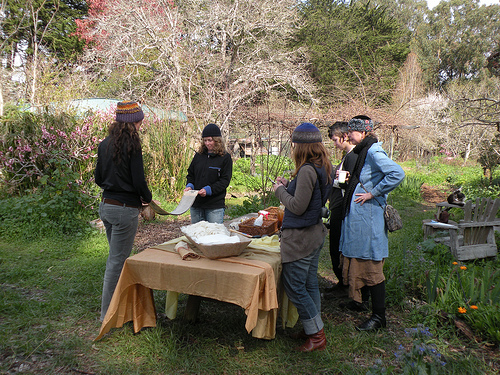 Thank you Permaculture Marin for your work! I am so grateful for all you did to make this day happen. Beginning months before we set foot in the garden, until the day of… The coordination of all the details in addition to the worlds greatest lunch, together made for a beautiful experience, now indelibly placed within the memory of all good things. great photos. looks like a good energy day.